Welcome to Woof Wednesday. Please meet some special dogs from CA, IL, NC, NJ and all in need of good, loving homes. Triston is a cute little 4 month old Westie fellow. He was a puppy mill surrender. Triston is just a little shy, but coming around very quickly, wagging his tail bouncing and playing. 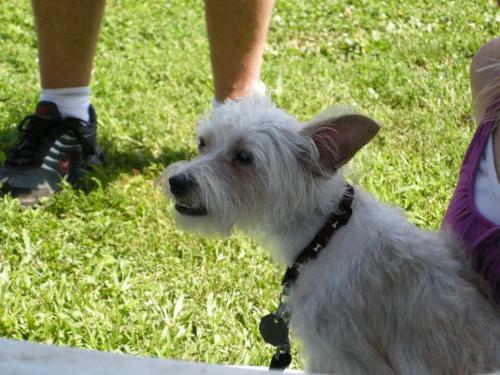 Scruffy is a westie/yorkie mix. He is a very sweet disposition and lots of energy. He enjoys playing and playing, and did we mention playing? Scruffy is about 2 yrs old. is neutered, and has all his shots, he is very friendly with other dogs and people. And, he is very cute! This rescue prefers no calls, if interested fill out application and submit through email. Skittles is a 5 month old yellow lab/fiest mix. Skittles is a very playful, sweet boy. Skittles is up to date on his vaccines and he is neutered. Skittles is house trained, crate trained and leash trained. He is ready to go to a loving home. He needs a fenced in yard, so that he can run and play and he plays well with other dogs. Lets find this sweet dog the home he deserves. This guy is urgent he is being held at the Kern County Animal Control which does not have a lot of room and cannot keep dogs that long. He is a terrier mix who needs to find a home soon! Love them all and will be praying that they all find awesome homes with loving people.